My families history with Muskoka starts here, with my mother and in extension her siblings and parents. She spent her youth running through the woods and jumping off island cliff faces. Her father was an active member of the local sailing club and got a big kick out connecting his family with the nature that can only be found in Ontario’s cottage country landscape. The family cottage sat just up stream from the Port Sydney Falls on Mary Lake. When I was a child my parents purchased a cottage on the exact same lake across from Crown Island. The cottage was winterized so we were up there year round. We spent our entire Summer vacation as kids at the cottage with memories that feature great family dinners and days filled with swimming, water-skiing and reading a copious number of Archie comics and Michael Crichton thrillers. In the Winter we skied, in the Spring we avoided black flies and in the Fall we celebrated Thanksgiving with Tom the Turkey while staring out at the regions stunning Cavalcade of Colour backdrop. I grew up in Muskoka and whenever I plan a trip I feel like I’ve returned home. 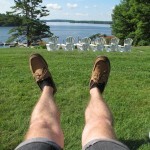 I was ever so excited when my friend Erin invited me up to Windermere House located in the heart of Muskoka on Lake Rosseau. Her father purchased the property in 2007 and in the early days she managed the resorts food and beverage concepts. 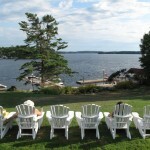 Last year Windermere welcomed Oliver & Bonacini with much anticipation from foodie fans who live in Toronto and enjoy cottage country throughout the year. I typically do culinary tourism research and hotel destination guides on the solo so was over the moon excited when I knew Erin would be my personal guide and partner in crime. 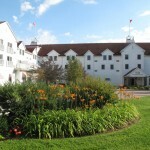 Originally established in 1870 by Thomas Aitken who ventured to Muskoka from the Shetlan Islands looking for a brighter future in Canada, the original lodging spot was favoured by fishermen. 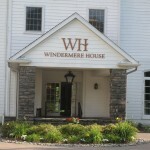 As tourists discovered Muskoka, Windermere House grew to become one of Lake Rosseau’s longest ongoing landmark resorts. 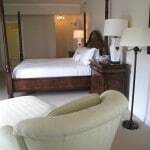 Over the last few years Windermere House has been known as a hotel for those who want to pamper themselves lakeside. 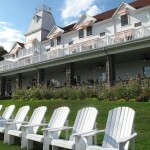 The resort has become famous for its five star service which Hollywood stars, hockey heroes, artists, poets, writers and captains of industry have made their destination of choice. 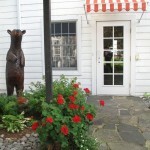 We pulled into the resort just after the lunch hour, tummies grumbling we immediately whisked ourselves onto the hotels famous verandah to enjoy two ice cold glasses of Muskoka Brewery Cream Ale. 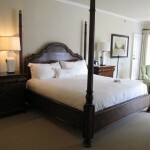 After a lunch of great leisure on the verandah we checked into the hotel and marched up to the third floor where I snooped about my new home, Suite 306. The staff had written me a delightful welcome letter with a bottle of sparkling water and wee box of chocolates. 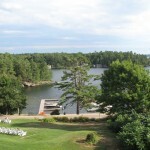 From my balcony I could see the resorts basketball and tennis courts, campfire, swimming pool and a jaw dropping view of Lake Rosseau. I had a chance to meet Erin’s father during my stay and was delighted to see his enthusiasm and vision for Windermere House first hand. Paul’s portrait can be seen hanging over the bar at PJ’s Lobby Bar, and his pursuit for perfection can be seen everywhere from the gracious smiles of hotel staff to the well manicured grounds of the property. 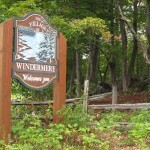 Paul spoke eagerly about Windermere’s new venture, The Windermere Cottages which represent the ultimate destination for stylish waterfront fractional cottage vacation residences in Muskoka. 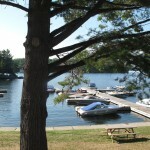 These three bedroom waterfront cottages are the creme de la creme on offer in the region. 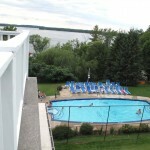 The real “cherry on top,” here is that those who invest in the Windermere Cottages have use of all of the hotels amenities. The best of which I experienced at the hotels very own Amba Spa. 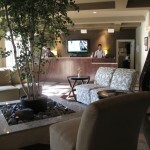 Erin and I adventured through the spas extensive “treatment” menu and were happy to see that the Spa also featured a Medical Director, Dr. Cory Goldberg who offers medical aesthetic services. Imagine an entire day lazing about on the dock in the sun followed by an evening of botox and bikini waxing! Is this the new cottage country dream?! We started off with a couples massage (hilarious) followed by a pedicure. Out of sheer curiosity I opted to have something waxed. I’ve always been curious about the whole “oy waxing hurts so bad,” ordeal and wanted to brave up and experience it for myself. I opted to have my back waxed and spent the next thirty minutes biting a towel and cringing. Over the next few days I could not stop fondling my lower back. While back waxing is certainly not a service I will be frequenting, it was a true delight to have hips that felt as soft as a babies bottom. The staff at the spa are fantastic and I really enjoyed their signature beverages, a choice of cucumber rosemary or grapefruit and blueberry water. A tasty way to rejuvenate and rehydrate. 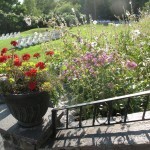 The spa was busy as a bee hive so be sure to book your treatment in advance. 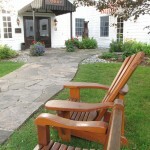 I’ve now come to realize one must finish their cottage country retreat with a proper pampering. Nothing like driving back to the city after a fresh pedicure! It was raining on our final day and as we hopped onto the highway bound for Toronto I flipped through the images on my camera and enjoyed a slideshow of the past few days. I stared down at my freshly polished toe nails as fresh rain streaked across the window. 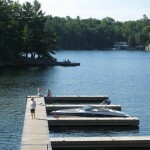 If you are planning your first trip to cottage country make sure to include the following quintessential experiences: overeating, always drinking, sun tanning on a classic Muskoka chair with your favourite book, a pine cone forage in the woods, early morning swim, water ski and wake boarding in the afternoon, an adventurous canoe ride and late night campfire staring up at the star filled night sky.